Droplr (com.droplr.droplr-mac) is a Mac OS X software application that has been discovered and submitted by users of iBoostUp. The latest version that our iBoostUp users have reported seeing on their systems is Droplr 14. The most popular version of this application used by our users is version 2.0.6. 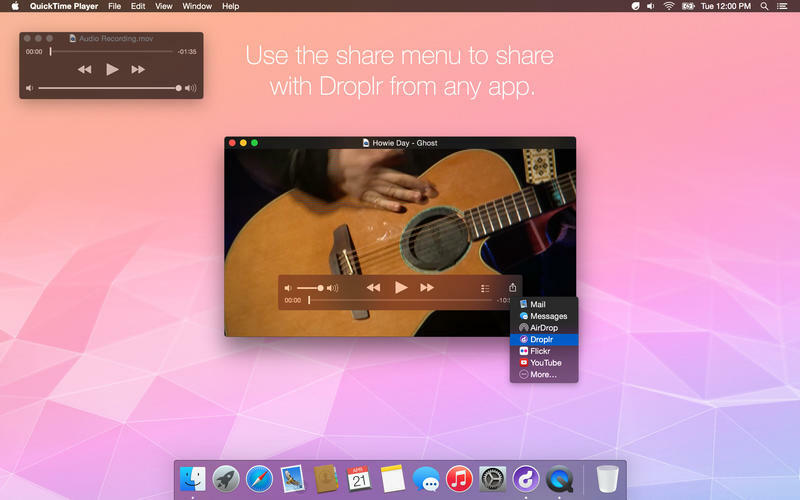 Droplr is a file-sharing tool for Mac. Effortlessly share files, screenshots, and screencasts with friends, colleagues, and clients. Start sharing today! With Droplr, sharing files is super simple. Just drag a file into the Droplr icon in your menu bar. Your file will be uploaded to your personal Droplr account in the cloud and a link to it will be copied to your clipboard. Paste the link anywhere to share. Manage all of your files online through the Droplr Dashboard or with your iOS device using Droplr Mobile. Files shared with Droplr Free will self destruct (be deleted) 24 hours after they're uploaded. Droplr Pro users get to keep their files forever, can customize download pages, and much more. Droplr Pro memberships are available via an in-app purchase. For more infomation on Droplr please click here, or to find updates and downloads of Droplr please click here.